The director is responsible for shore and mooring locations, boat parking facilities, boat docks, Club boats and equipment. Past Commodore Jon Carnes is assisting Ken with kayak placement. All boats and trailers left at OYC, including kayaks and canoes, must have an OYC identification sticker on them. They are available from the Waterfront Director. The director will assign a spot where boats and trailers are to be kept for the season. The lifeguard boat is for the exclusive use of the lifeguards and must be kept free for emergency use at all times. In the case of a shortage of oars, the lifeguard boat oars must be kept as a complete set. The two (2) Club rowboats are for use by boat owners who have boats moored. Club rowboats must not be left at moorings. Children are not allowed to use rowboats without adult supervision. The Committee Boat is for the use of the Race Committee and an authorized list of members as designated by the Sailing Director. BOATS OYC has a variety of boats available for general member use and are listed below. Please look for the OYC boat sticker to assure you are not using someone's personal boat. Paddles and life jackets for all the above boats and are located under the main deck. No one under the age of 12 shall be allowed to take a boat without parental “on-the-water” supervision. Members age 13-15 requires direct visual parental supervision. Members age 16 and under shall not take boats further than Martin Point from shore, not beyond Martin Point northward and no farther south than the south-most mooring buoy without adult supervision. Demonstrated ability and/or a Junior Sailing Certificate are considered to extend this limit on a per use basis (due to varying weather conditions) with parental permission so stated on the release form. It is recommended that anyone under the age of 18 should pass a swimmer raft test. Members must sign a “Use Form” prior to taking a Club-owned boat out and again upon the return of the boat. In the event of threatening conditions Lifeguards will sound repeated blasts from an air horn. All Club-owned boats must immediately return to shore. Appropriate life jackets (PFD) must be worn at all times while using. All Club owned boats shall be returned one hour prior to sunset unless. participating in an OYC scheduled boating event. Any lost or damaged equipment is the responsibility of the member using the boat. Failure to follow these procedures will cause a member’s boat use privileges to be revoked. If members are not going to use their assigned shore or mooring space during a given season, they must notify the Waterfront Director. 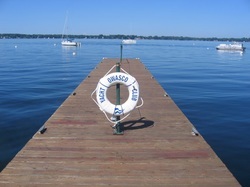 A member may leave his hoist or mooring space vacant for one year. A member may sublet their hoist or mooring space for one year with the approval of the Waterfront Director. Subletting will be done from the waiting list maintained by the Waterfront Director. Reassignment of shore or mooring space will be made by the Waterfront Director. Reassignments will be made according to the waiting list. Terms of purchasing or subletting hoists, mooring equipment, etc., will be negotiated between the buyer and seller. Positioning of the mooring buoys and the type of ground tackle used must be approved by the Waterfront Director. The shore or mooring space waiting list will be updated and published annually. Please check the Hoist Wait List page for current list.